The hugely-hyped TJ Hertz delivers a release for Hessle. 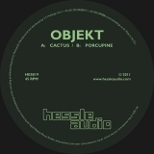 'Cactus' is a standard wobbly bass shuffler, but 'Porcupine' is more distinctive, as hammering beats lead into a thrilling, filtered chord breakdown. Is the attention deserved? Not on the evidence of 'Cactus'.